As explained in the section on Knee Anatomy, the knee joint is an articulation between the lower end of the thigh bone, the upper end of the shin bone and the patella. If this becomes severely worn it is possible to replace the joint surfaces with a prosthetic joint called a knee replacement. A knee replacement is really a surface replacement of all or part of the knee joint and is made from metal and plastic. There are many different designs available and modern knee replacement designs have an extremely good life span. If all three of the compartments of the knee are worn, it is necessary to perform a total knee replacement (see diagram and x-rays), but if only one compartment is worn it is possible to perform a partial replacement (see diagram and x-rays). Who may benefit from knee replacement? Knee replacement is only considered when the joint surfaces are severely worn resulting in severe symptoms that limit functions of day-to-day activities. The two main reasons for the knee becoming worn are osteo-arthritis and rheumatoid arthritis. Occasionally knee replacement is necessary after fracture to the joint surfaces as a result of accidents or due to severe bow-legged or knock-knee deformity. The operation of knee replacement requires a short stay in hospital – normally 2-4 days. You will have some simple pre-operative tests before coming into hospital but then be admitted on the morning of surgery. 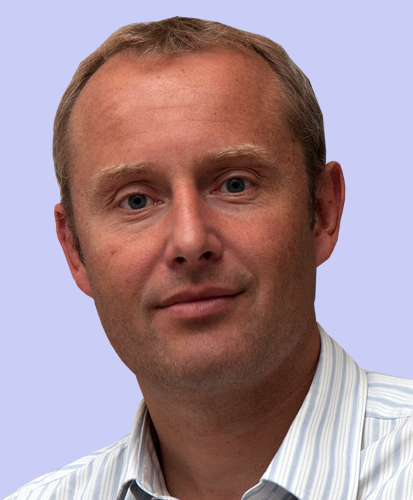 The operation takes 1-11Z2 hours and can be done under either general or spinal anaesthetic. Please see the page on anaesthetic information for more information. My anaesthetist and I use a special technique to help control the pain after the operation which involves injecting a specialist mixture of local anaesthetic around the knee. As a result most patients are able to stand on the afternoon of their operation. However, it is normal to have some pain after the operation and you will need to take regular pain killers whilst in hospital and for several weeks afterwards. Most patients are able to go home 2-4 days after the operation once they are able to walk safely with crutches and manage the stairs. You will need some medication for 10 days after the operation to reduce the risk of blood clots. Most people are able to return to driving after 6 weeks and usually feel they have returned to normal day-to-day activities after 10-12 weeks. You will go on improving for over 12 months as your movement and muscle strength returns and the knee feels more normal. When most of the knee is worn out with complete loss of the articular cartilage and exposed areas of bone, it is necessary to perform a total knee replacement. This involves resurfacing of the lower end of the femur to replace all three compartments of the knee with a metal prosthesis and resurfacing of the upper end of the tibia with a metal component that then allows a plastic tray to be clipped in to place. This way a new joint surface is formed between the metal femoral component and the plastic tibial tray. The under surface of the kneecap can also be replaced with a plastic button. Total knee replacement, therefore, replaces the entire bone surfaces of the knee joint and also sacrifices the anterior cruciate ligament and in some cases the posterior cruciate ligament. Despite continued improvements in the design and materials used for new replacements, a total knee replacement does not usually feel like a normal native knee. Only about 1:4 patients report that their knee feels completely normal after TKR – the so called forgotten knee. However, over 90% of patients are happy that they have had the procedure performed because a TKR is a very reliable way of improving the severe symptoms of arthritis. In approximately 30% of patients the arthritis only affects one of the three compartments of the knee and in these circumstances it is possible to perform a partial knee replacement that only replaces the affected compartment. There are a number of advantages of performing a partial knee replacement and these include less bone resection and maintaining all the ligaments within the knee which allows the knee to move and feel more like a normal knee. Partial knee replacement can also be performed through a smaller incision resulting in less pain, less blood loss and a quicker recovery. Some complications of knee replacement surgery, such as infection, are also less common in partial knee replacements. Partial knee replacement also requires less time in hospital and most patients are discharged on the third day after their operation. A partial replacement of the inner or outer compartments of the knee is called a medial or lateral uni-compartmental knee replacement, and a partial replacement of the kneecap and trochlea groove is called a patello-femoral replacement. 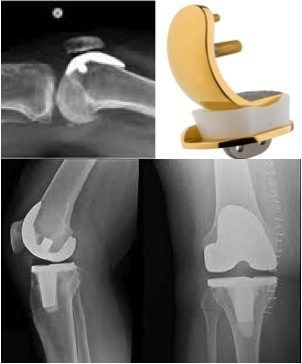 Modern designs of knee replacements have excellent long-term survivorship. Studies show that over 90% of total knee replacements are still working well 10-15 years later. The survivorship results for partial knee replacement are slightly less with 85% surviving 10-15 years. The main reason for this is progression of arthritis in the rest of the knee after partial knee replacement. Knee replacements can fail and require further surgery due to wearing out, loosening, becoming infected or due to fractures around the knee. I use a surgical technique for both total and partial knee replacement that uses a smaller incision to allow more rapid post-operative recovery. I also use a special injection around the knee which helps control pain immediately after the operation. In female patients who have a slightly narrower knee, I use the female gender specific knee to help reduce the risks of pain at the front of the knee after the operation. I would be happy to discuss this further with you if appropriate. What are the risks of knee replacement? Knee replacement is a big operation and unfortunately as with all surgery there is a risk of complications. The good news is that the risk of complications after knee replacement is actually low and we are able to take a number of precautions to reduce them further such as giving antibiotics and anticoagulants that reduce the risk of infection and blood clots. In some partial knee replacements it is possible for the mobile bearing to dislocate. The risks include infection, bleeding, blood clots, damage to important nerves and blood vessels around the knee, wound healing problems, stiffness and persistent knee pain. In the long-term the knee replacement may wear out or become loose and it is possible to fall and develop fractures around the knee replacement. The risk of serious medical problems such as heart attack or stroke after knee replacement is extremely rare. Not surprisingly, some of the risks are greater in patients who have other significant medical problems or who are overweight. It is normal to have a patch of numbness on the skin around the incision required for knee replacement and many patients find it uncomfortable to kneel. Please see the total knee replacement consent form for more details and of course I would be very happy to discuss any concerns you may have.